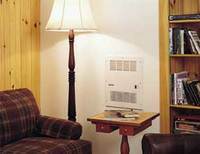 Fan Convectors are designed to provide heat in a minimum of space using forced convection. Myson's efficient tangential fan design forces air uniformly across a low pressure drop heat exchanger, resulting in a high heat output from a very compact space. Myson Fan Convectors deliver excellent heat from a hot water coil or electric element. That&apos;s because the fan, blowing across the heating source, transfers 10 to 100 times more heat to the air than is possible from units that rely on radiation or natural convection.